Freshman Samara Douglas. Photo courtesy of McIntyre Imaging. 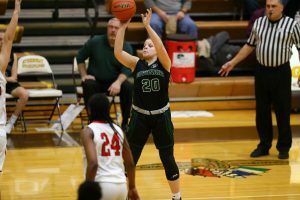 The Girls Basketball team (16-8) got off to a slow start last night in the first game of what they hope will be their fifth consecutive IHSAA sectional title. The Lady Warriors were facing Park Tudor (14-8) in a rematch of last year’s Sectional #43 final, one in which CCHS won 58-40. Despite last night’s slow start, Covenant pulled away with a strong second half for a 70-40 victory. The Lady Panthers used a 9-0 run after Covenant scored the game’s first basket to run out to a 9-2 lead just five minutes into the contest. After CCHS seemed to struggle to figure out the Park Tudor 3-2 zone defense, the Lady Warriors rallied with a strong surge to end the first quarter, notching a 10-0 run of their own, to lead 12-9 after the first quarter. Sophomore Bonnie Ludlow came off the bench midway through the first frame to help spark the run to end the quarter. The second quarter was again another back-and-forth eight minutes, as Park Tudor scored the first five points of the quarter. The Lady Warriors again seemed to take control in the final minutes of the first half, taking a 26-23 lead into the break. A half court 1-3-1 press really turned the tide for Covenant coming out in the second half, with the traps and pressure off of this defense leading to a lot more scoring chances in transition for the Lady Warriors. Covenant outscored Park Tudor 25-5 in the third, and a 44-17 scoring advantage for the second half, to blow the game open. 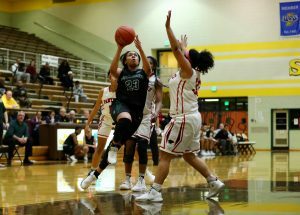 Junior Ilani Williams-Harris led a quartet of double-figure scorers for CCHS, as she scored 17 points to go with 3 rebounds, 6 assists, and 3 steals. Sophomore Bonnie Ludlow netted 14 points to go with 6 boards, 4 assists, and 2 steals. Junior Sania Borom recorded 11 points, 4 rebounds, 3 assists, and a game-high 7 steals. Freshman Samara Douglas also had a strong game, with 10 points, 5 rebounds, 3 assists, and 2 steals. Sophomore Bonnie Ludlow. Photo courtesy of McIntyre Imaging. The Lady Warriors will now advance to face host Speedway HS (16-5) who had a first round bye. The Covenant/Speedway matchup is scheduled for Friday night at 6:00 pm in the Morris Pollard Gymnasium at SHS. The other semifinal, which is scheduled for 7:30 pm on Friday night, will pit Shortridge HS (14-8) against Scecina Memorial HS (6-17). Shortridge also had a first round bye, while Scecina defeated George Washington CHS (4-16) 64-38 in the other first round game on Tuesday night. Friday’s two winners will meet in the Sectional #43 final on Saturday night at 7:00 pm.